When people asked me what I would do when I retired I always responded "travel." "But that's expensive." Yes, traveling to Argentina and Antarctica is expensive, but that's not what I meant. I enjoy poking around. I enjoy finding obscure walks, especially beach access on Puget Sound and the other salt-water bodies around Seattle and I just enjoy walking and being outside. Whidbey Island - This is what I classify as a "one-day destination trip." Puget Sound has lots of places worthy of a day for the kind of explorer I am. One day and about a half tank of gas, lunch and, when available, admission to the local historical museum. We decided to go on Wednesday because it was the only day with a decent weather forecast, as of Sunday night. Well, Monday and Tuesday had sunspots and little or no rain; Thursday also. But Wednesday came out the worst, not the best. Mostly a high, dull overcast with rain as we were driving returning home. We drove to Mukilteo to take the ferry to Clinton at the south end of Whidbey Island. It is a shorter run than the cross-Puget Sound ferries, so it is both cheaper and more frequent. There is no need to look at the schedule, it is so frequent; just go. On the crossing to the starboard/right side (north) it was just a dull gray. To the port/left side it was more interesting because there were white caps on the water. Langley is a picturesque waterfront town very worthy of the stop. But we bypassed it because we were focussing on our hike. We took a scenic longer route by going past the Keystone ferry landing and Fort Casey on highway 20. (It ends at the ferry.) This give additional salt water view versus staying inland and doesn't add much distance. Fort Casey is one of the coastal gun emplacements from around 1920 and one of the best preserved. We have been there many times and bypassed it today. Continuing north just before reaching highway 20 we turned left/west for about a half mile then went south to Ebey's Landing. Ebey's Landing requires a whole line for its ownership designation - part state park, part Nature Conservancy, part national historic reserve and a bit of it is privately owned. It is one of the choicest beach walks in the Puget Sound area. It directly faces the Straight of Juan de Fuca and so get more wind and wave action than most areas. Plus is has a 230-foot high bluff. So your hike can be a great combination of the grand view while walking the bluff plus walking at the edge of the waves on the return. The weather stayed dull gray with a considerable wind. We didn't do the loop, but hiked the bluff to about 1/4 mile short of connecting to the beach trail, then retraced our steps. Today I preferred to double the high view time over walking the beach. Distance 3 plus miles. Time: one hour 15 minutes. 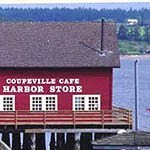 Then we headed north less than five miles to Coupeville seeking hot coffee and dessert. Being a cloudy April Wednesday some businesses were closed. But someone directed us to the building on the end of the old dock. It has a "espresso/marine supply" store that was really espresso, snacks and gifts/trinkets, including some interesting spices and herbs. Coupeville is as picturesque as Langley. It has always been one of our waterfront favorites. We drove around the end of Penn Cove, seeing huge rafts that host famous Penn Cove mussels growing. Continuing a few miles to Oak Harbor. It's an OK town, but being military it is very utilitarian - more fast food and fewer business that take the extra time and extra care we like. Continuing north we did a short walk at Deception Pass bridge. The state park is Washington's most popular (and very large), but we skipped it today. We also bypassed Anacortes, which is our current favorite. We will make other day trips there. We made a quick pass through the tulip fields just west of Mount Vernon in the Skagit River delta. We didn't go to one of the destination mega tulip farms, due to the dull weather. So we had time for a brief exploratory trip to the Skagit Wildlife Refuge. We saw snow geese from a distance while driving through; they weren't close to the roads we were traveling. But we did see... it looked like a white tulip field, but some of the tulips took off and flew! This was on Fir Island, an island in the Skagit River delta, just west of Conway. Conway is just west of I-5. Soon we were on our way zooming home. And soon in the rain, though it never interrupted the many times we got out of the car. The photos: Ebey's Landing showing the cultivated field and edge of the bluff. The Couplville dock where we had espresso and pastry. Click to enlarge.